Virtuoso Cellist Saskia Rao-de Haas on her Indian Cello and child prodigy Ishaan Leonard Rao on Piano will be performing in a unique concert ‘From Bach to Bhupali’ at the Alliance Francaise, New Delhi. This rare mother-son duo has already enthralled audiences in Australia, France and Bangalore. In this concert, many imaginary geographical and generational boundaries will not only be crossed but also erased. Delhi-based Dutch cellist Saskia Rao-de Haas is a world famous cellist whose career spans over two decades. She has performed at prestigious music festivals and theatres—John F. Kennedy Centre for Performing Arts in the US, the Musee Guimet in Paris, the Concertgebouw in the Netherlands. Married to the famous Sitarist, Pt Shubhendra Rao, it is no surprise that their son, 14 year-old Ishaan has became a remarkable musician at this young age. 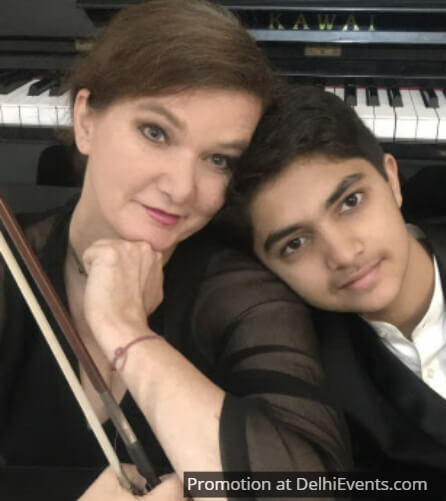 Ishaan has already got many firsts to his credit– India’s youngest musician to finish Grade 8 of the prestigious ABRSM at the age of 11, the youngest ARSM diploma holder at the age of 12. He was chosen as “one of the young musicians of the year” in 2017 by the Mumbai-based Olga and Jules Craen Foundation. The mother and son duo come together on April 5th, 2019 at the Alliance Francaise to explore their musical heritages of Indian and Western classical music as a way to show the unity and universal laws that govern all music. In their program together, you will hear Bach’s well-tempered clavier, Philip Glass, the very difficult Rachmaninoff, Arvo Part, Sufi Hidayat Khan, compositions by Saskia Rao de Haas and more.